Growing up I lived a block away from a 7/11 and living in close proximity to a 7/11 meant that I could walk over and grab a slurpee whenever I wanted. When I was in grade one I moved houses and my simple walk turned into a short bike ride. As the years went by I moved again and my bike ride turned into a brief car ride. For those of you who haven’t figured it out yet – I am in love slurpees. Unfortunately this story isn’t about my affection for this sugary treat, but something much deeper. North Bay has no 7/11s… No big deal. I have decided to join forces with Mac’s Milk unitl I return home. The routine was simple enough. I walk in, pour my “froster”, grab my toonie, slide it to the girl at the counter, and receive my ten cents change and enjoy my frozen treat. I was able to function like this for awhile until one day the girl at the counter told me some horrific news. “Frosters are no longer $1.90. Price changes meant they were now $2.01”. I didn’t have a penny so I gave the girl $3.00 and received .99 cents change. I went home rather distraught and dropped my .99 cents into my change cup. I sat there sipping on my froster and thinking, “How could they change the price on me?” I know it’s not Mac’s fault, but every time I seem to get comfortable things begin to change. It reminded me of a conversation I had back in high school with a good friend of mine. We talked about the inevitability of change and how whether we like it or not life is going to continually change and we can either accept or reject those changes. I turned on the television and I was confronted with messages about climate change, about a campaign for change, how to change your body, how to change your looks, how to change your personality, your smile, the hair on your back, your look on life, your husband, your wife, your kids, your car, and how to change YOU! 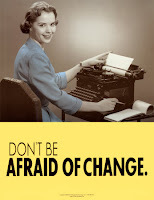 It seems as though “change” is a common theme in our daily lives. What often makes change scary is that it will happen with or without your consent. For me it’s a froster and for others it’s car insurance or a best friend. No matter what the case – change affects us. A friend of mine sent me a message the other day about a book she was reading and how it asks readers to “be the change you want to see in the world”. At heart I find this to be a very positive statement that makes me feel like all change is possible if we take the time to see it happen. But, what I am talking about here is dealing with change. Acknowledging that change will happen and that people need to be conscious when it does happen and make decisions accordingly. Accept change. Embrace change. All around the world people are asking for change, but sometimes the toughest thing of all is dealing with the change once it has occurred. Just like my froster changed – so will your froster. I had initially thought it suitable to write the president of the company and demand a change back to the original price, but I decided against it. He or she is just trying to accommodate for the changes going on in their lives and need to adapt to make a living. Instead, I decided to put my change to work. I collected all the money out of my change cup and found that I had saved close to thirty dollars. Now I can buy close to 15 frosters. At the end of the day it’s all about making change work for you. I was just thinking about this same thing a few weeks ago. I was telling Steph how I love my life right now, the way it is, and that I don't want it to ever change, because I'm afraid that once it does, it will never be as good as it is now. It's a scary thought some time... but it's also true that in order to get to this point, i've had a lot of change from what my life once was (which is infinitely more different than it is now). So in truth, life is ABOUT change. Without it, there would be no life, no progress, no stories to tell, no lessons learned. Remember we never change alone. If we change then chances are the people around us have changed. The trouble is not everyone knows when they have changed sometimes changes are subtle. Regardless it is the way of the universe. As always Sean something profound to think about. Look forward to seeing you soon. Now that the slurpee has a story everything is right in the world. Thanks man.